Dr. Yeargin is an Assistant Professor in the Physical Education and Athletic Training Department at the University of South Carolina. An expert on child and adolescent hydration and heat illness, she is the author or co-author of twenty-five peer-reviewed journal articles, and has made over 20 professional presentations at the local, national, and international level on thermoregulation and hydration behaviors. Dr. Yeargin is the official liaison for the National Association of Athletic Trainers (NATA) to the American Red Cross. She also serves as a member on NATA's Pronouncement's Committee and Free Communications Research Committee. The myth that children are more vulnerable to heat than adults is based on the first studies of youth exercising in the heat conducted in the 1970's and 1980's. More recent research shows that, while youth use a different thermoregulation strategy than adults, they are still efficient at dissipating and handling the heat, at least in mild to moderately hot conditions. Sweating results in the loss of both electrolytes (particularly sodium) and water. Orange juice, moderate salting of food in the diet, and sports drinks help replace electrolytes such as sodium, potassium, and chloride lost during sports. Surprising, as it may seem, the most important part of an athlete's diet isn't what they eat, it is what and how much they drink. 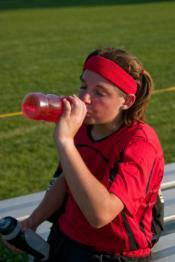 Drinking fluids before, during and after sports is especially important for pre-adolescent children because they have special fluid needs compared to adults, or even teenagers. Recent research, however, suggests that a "one-size-fits-all" prescriptive advice to drinking is outdated because sweat water losses are dynamic and and because the three main drivers of sweat water loss are highly variable in children. After birth every baby is tested for a wide variety of conditions and diseases. 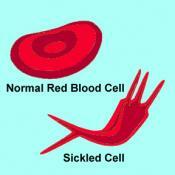 One of the tests looks for the condition called "Sickle Cell Trait." Ordinarily, a relatively benign condition, sickle cell trait can have potentially devastating implications for youth engaged in sustained, intense exercise, such as in sports practices, which can result in a life-threatening condition called exertional sickling.